Huawei Jitterbug Touch 2 user guide manual – Huawei Jitterbug Touch 2 for GreatCall latest Android smartphone come with excelent quality and ease to use. 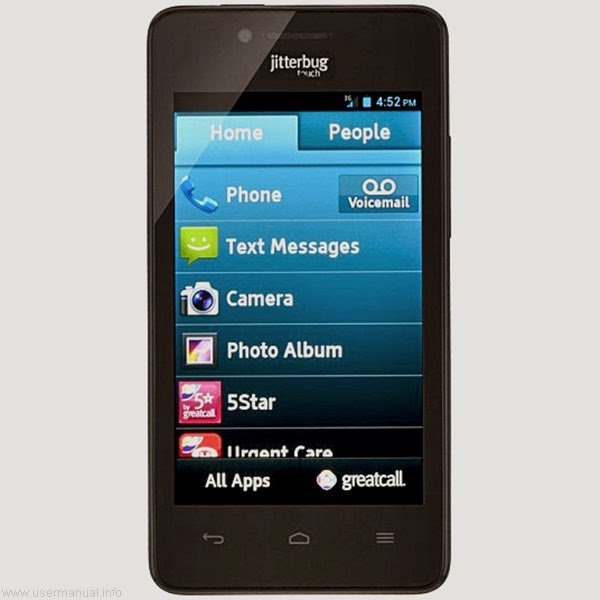 Huawei Jitterbug Touch 2 come with some improvements added comparing from its predecessor, Huawei Jitterbug. The smartphone buzz from GreatCall bundles with GreatCall’s data and calling plans and simplified Android interface. This smartphone is feature phone for the carrier and its rebuilt, more exactly is rebrand from Huawei Ascend Plus with 5star urgent response, MedCoach that lets customers to schedule reminder for pills or access database drug store and UrgentCare. Huawei Jitterbug Touch 2 equipped with specifications and key features such as: 124 x 64 x 11.4 mm (4.9 x 2.5 x 0.45 inches) in dimension with 139 g (3.9 oz), 4.0 inches TFT capacitive touchscreen display 16 million colors 480 x 800 pixels screen display, microSD up to 32 GB, 4 GB internal storage, 512 MB of RAM, 5 megapixel rear facing camera with autofocus, 0.13 megapixel front facing camera, run Android 4.0.4 operating system, powered by 1 GHz dual core Qualcomm MSM8625 processor, Li-Ion 1750 mAH battery with 5.3 hours of talk time and up to 320 hours of stand-by time. Huawei Jitterbug Touch 2 user guide manual for GreatCall available to download in pdf file format with 1.24 MB size and contains of 88 pages. Huawei Jitterbug Touch 2 manual pdf for GreatCall will help users, owners and buyers with important information you need about the smartphone including key features, add functions, settings and some solution for troubleshooting.